Was in midtown at lunch, tried to find a parking spot for Sacramento Goodwill's 40 percent off day, but even the side streets were claimed so I ended up going later in the day. 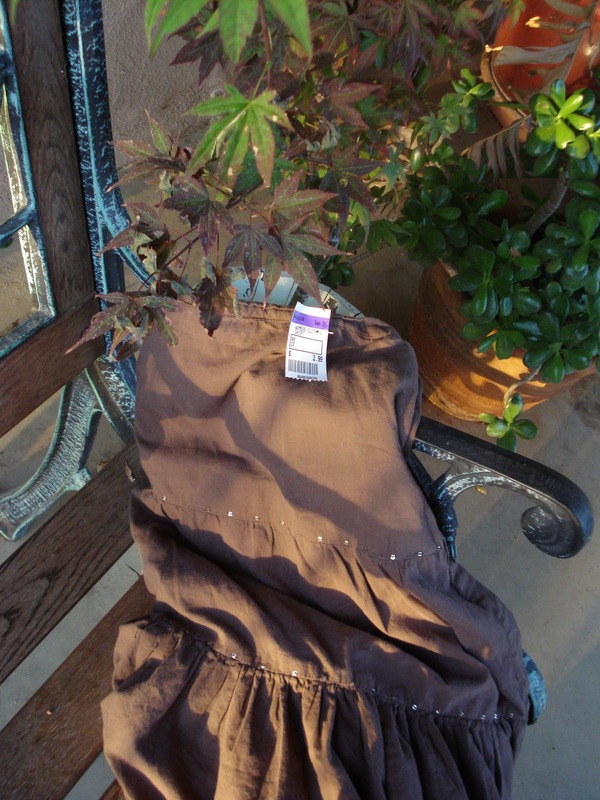 Found a dizzy lizzy brand brown sequined soft cotton kind of knock-around skirt. The Thrift Town on El Camino in Sacramento (yes, I'm a regular there ~) produced a Charter Club black cashmere sweater for $9.99 and the two CDs (just for fun) at $1.49 each. I am always on the lookout for silk and cashmere items. My dry cleaner calls me the "sweater lady" because I bring in armloads of sweaters at a time. I snap up cashmere sweaters in January at Macy's 50% off sales that originally run $100. So this little black number truly is a find! for their buy $20, get $10 off sale. 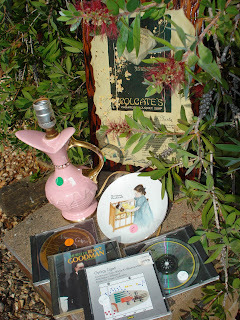 Green-dotted items were 50 cents, including the lamp, the bathroom soap decopauge sign, the Benny Goodman greatest hits CD and the clothes in following picture. White-tagged items were 25 cents, so all in all I spent $10.75. 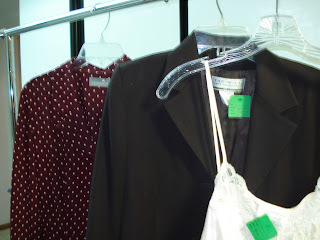 A short ornate peach-colored night gown, an Italian made The Works Saks Fifth Avenue brown blazer and a Liz Claiborne polyester dress. Amazes me that each piece cost 50 cents! If they don't fit, I just recycle them back as donations. I hold myself to the rule ~ one bag in / one bag out. 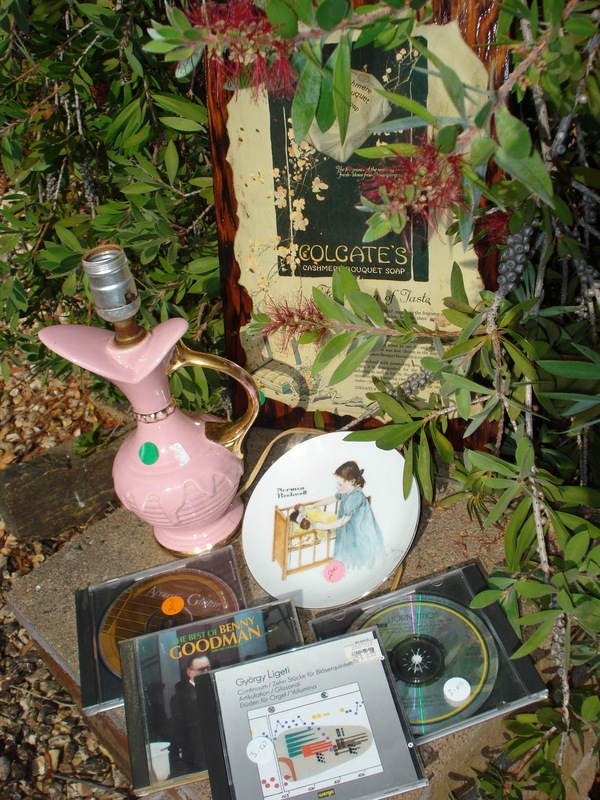 With a lunch hour foray to Eco Thrift, I was rewarded with these two finds. Jones New York is one of my favorite brands! The skirt is a lovely print. United States Sweaters is a brand I'm not familiar with - the sweater is cute and comfortable. Eco Thrift pricing varies wildly, on the one hand there are items priced in the thrift shop range, and on the other hand pricing is near new retail. Stumbled onto a treasure-trove at the Amador Hospice Thrift Shop. Found my Christmas party dress ~ a retro-look by La Feme ($4.00). Looks even better on than it does on the hanger. I usually never buy vinyl records but it appeared an extensive collection had been donated to the hospice. So, at $1 a record, I figured I might be able to sell at least one of them to a collector. 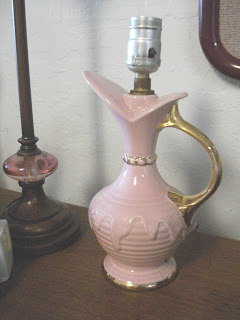 Found one of the items on my thrift shop wish list ~ original black Americana salt and pepper shakers. I have been watching these types of items of EBay for quite some time and vintage shakers like these price at $20 and up. Thrift Town in Sacramento priced them at $15.99, and I used a $5 off coupon! 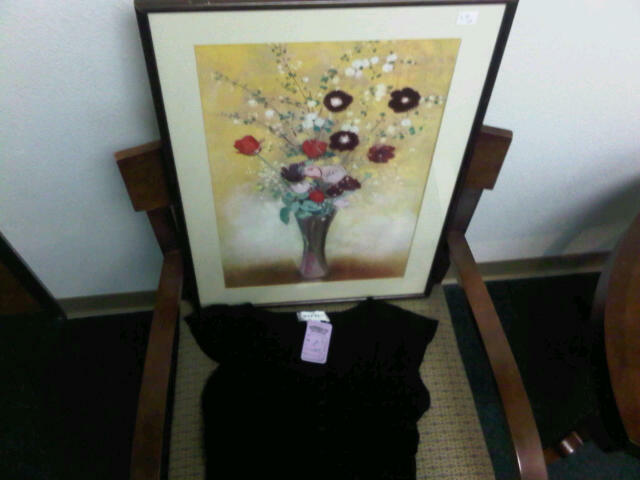 A lunchtime visit to Thrift Town on El Camino in Sacramento resulted in a framed Odilon Redon print ($4.99) and a Nine West black knit top ($5.99). I enjoy changing out the pictures in my office and home on a frequent basis, so I am always on the lookout for new and interesting ones. Picked up a new craigslist kitty today from a couple in Carmichael. Had the cat carrier with me but no way to take the kitten outside. I did a quick run over to the SPCA Thrift Shop on E Street in Sacramento for a makeshift collar ($3.98), leash (98 cents) and water bowl (98 cents). Admittedly, these stuffed animal "rescues" are more cutesy than kitschy. But before I trade them out for my fall decorations, I wanted to show them off.